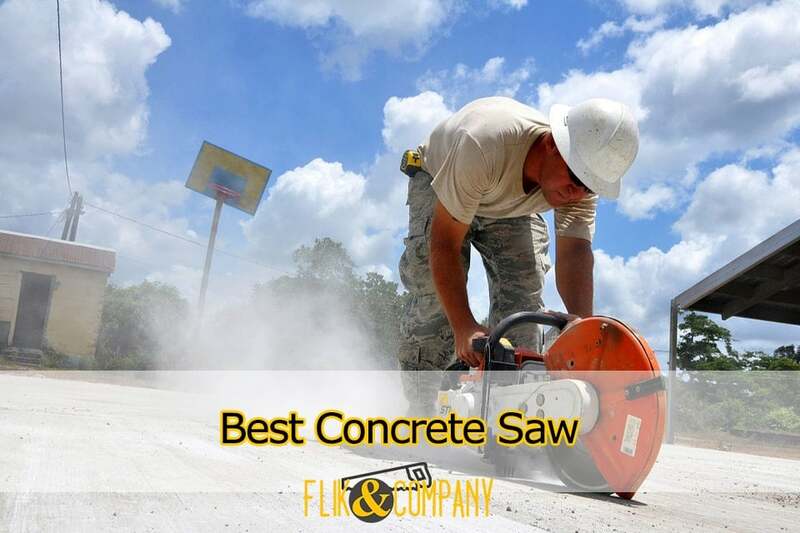 Happen to look for the best concrete saw? Then welcome to our concrete saw review! 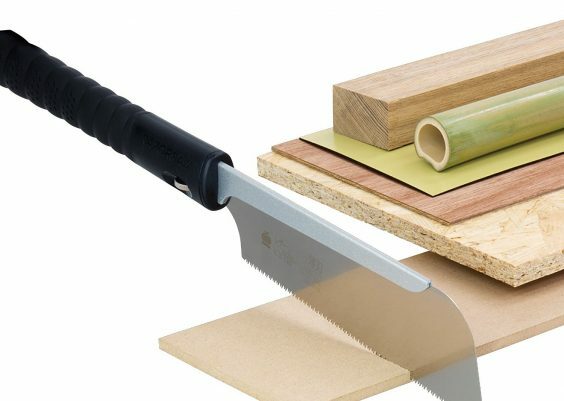 For today’s material, we have picked 8 great saws that we consider to be the best out there. And besides, we have prepared an in-depth guide to help you decide between various saw types. Let’s get started with our guide! It’s time to cut some concrete! Floor concrete saws, also known as walk-behind saws, are used to cut flat, horizontal surfaces like concrete floors, roads, etc. They consist of large wheeled machines pushed along by the worker. One could draw parallels with canister vacuums in the way floor saws are used. 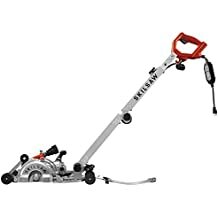 Floor saws are used by contractors to create grooves in concrete to then lay down utility and electrical lines through. They can also be used to do decorative jobs. Wall saws are specifically designed to cut walls, as evident from their name. These saws are also called track saws due to the fact that they are guided along the wall through tracks that are mounted beforehand. Handheld saws are more suitable for smaller projects and those that require finer work, be they on horizontal or vertical surfaces. In addition, a handheld saw would be the only usable tool in restricted worksites. Wire concrete saws are used for jobs that are too large or tough for other types of concrete saws. Instead of blades, these saws use special heavy-duty wires that are pretty much capable of dealing with any kind of concrete, be it reinforced or not. The wire of such a saw is fed through the material. When you then power the saw, its motor starts to rotate the wire through its loop, and the friction generated by the wire quickly abrades the concrete. Concrete saws can be wet and/or dry. Wet saws employ water to cool down the saw blade and dry saws don’t, as their names suggest. Aside from cooling, what water in wet saws also does is flush out debris from the worksite and reduce dust. Wet saws can be used with few intermissions thanks to this. Overall, because of their superior cooling, wet saws are more suitable for high-volume jobs where prolonged cutting with few intermissions is required. Dry saws don’t have all those benefits. Thereby, you may need to pause sawing to let the saw cool down and use personal protection devices to keep yourself safe. And besides, you would also need to make sure to remove all the dust from the saw after finishing the job to prolong its life. However, dry saws can be used in areas that need to stay completely dry. And besides, if you won’t be sawing continuously, the hassle of plugging in a water hose isn’t worth it. Concrete saws can also be powered by gas or electric. Each type has its advantages and disadvantages. Because gas saws don’t rely on electricity like their electric counterparts do, they can be used in job sites with no power sources. Another benefit of no electricity is that gas saws are safer than electric ones when cutting wet. Gas saws also tend to be more powerful than electric concrete saws. On the other hand, gas saws require much more maintenance than electric models. They have a motor, after all, so you’ll need to make sure that its components are clean and fresh. The fumes produced by gas saws make them unsuitable for interior jobs as well, unless the area is well-ventilated. And besides, because of their increased power, gas saws tend to be noisier and heavier than their electric counterparts. 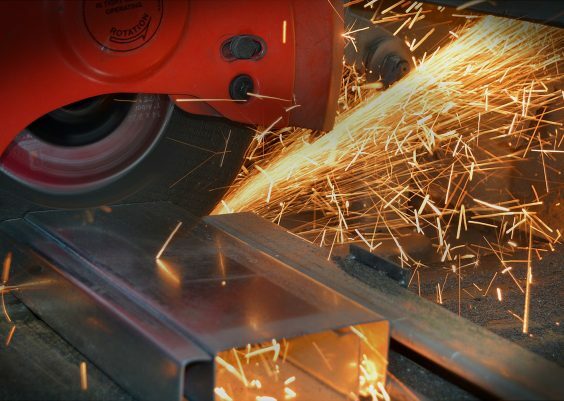 When it comes to electric saws, things are pretty much mirrored in them. Electric concrete saws tend to be more lightweight, easier to maintain, less noisy, and more environment-friendly than gas saws. They can also be safely used indoors. However, electric saws require electricity, first of all. They also tend to be less powerful, yet they require a lot of power for operation. Some saws may even need a 480V generator to work. Concrete saws that use blades usually employ segmented ones with diamond rims. 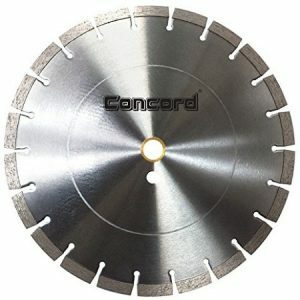 The segmented blades are designed to cut through hard concrete fast and with not much delicacy and precision. Segmented concrete saw blades are quite temperature-efficient: the channels between the segments let air through, which cools down the blade. Thanks to this, segmented blades maintain cool temps better than continuous blades, like those of tile saws. However, segmented blades still get hot under continuous load, so you should make sure that they don’t overheat. Evolution DISCCUT1 is a powerful electric concrete cutter. First of all, this thing is equipped with a good 15-Amp hi-torque 5,000 RPM motor that actually looks quite nice for the price. The motor is electric, so it obviously doesn’t produce any fumes. It cuts most hard concrete materials including reinforced concrete, stone, brick and paving. 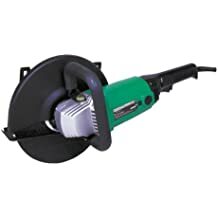 Besides, Evolution ships this unit with a 12-inch diamond blade, so you won’t have to get one separately like it is with some other saws we reviewed. When it comes to noise level and vibration, this machine offers pretty typical specs at its price point: 112dB of max noise level and 3.788 m/s2 vibration. Do note that this cutter is dry cut though some users have success with wet cutting. To be safe, use it only for dry cutting. And lastly, Evolution covers this concrete saw by a 3-year warranty. Strong, powerful 5,000 RPM motor. Equipped with a dust port. Won’t be suitable for heavy projects. Given its price, you shouldn’t expect much from Evolution DISCCUT1 concrete saw. However, it lives up with its features making this a great choice for versatile cutting. Its specs look nice, and that’s all you would want from a saw that can deal with small jobs at max. Husqvarna K760 is a gas-powered saw, meaning that you won’t have to deal with the downsides of electric saws like limited portability. And aside from that, K760’s specs look pretty good. Even great, we’d say. The motor of K760 is a pretty powerful one: it has a cylinder displacement of 4.48 cubic inches and about 5hp. K760 is designed to bring durability and reliability to a whole new level. To ensure that, Husqvarna equipped it with numerous mechanisms like their dust-sealed starter, blade shaft and bearings, and a poly V-belt. Another interesting thing about this saw is that it can cut both wet and dry, depending on what your job requires. The vibration levels of K760 concrete saw are also remarkable – just 2.5 m/s2 – which would allow you to use this saw in more delicate projects. But when it comes to noise level, K760 is okay at best: its noise level is 115dB. 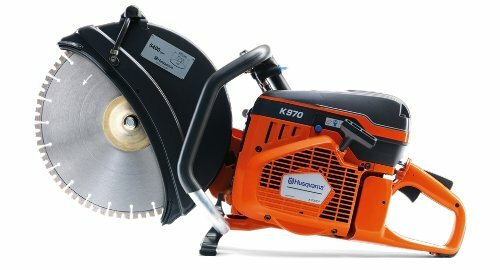 Finally, Husqvarna covers K760 by a 1-year warranty. Gas-operated: can be used with no electricity. Can cut both wet and dry. Has a dust-sealed durable starter. Doesn’t come with any blades. K760 II delivers great performance and is very durable, as it should be at the price point. However, keep in mind that you need to buy a blade to get this thing working. Hitachi CC12Y is yet another rather inexpensive saw on our concrete saw reviews, though it certainly isn’t a budget pick. It just got the specs that you’d probably need in not so large-volume projects. The motor of this saw is a 15-Amp 5,000 RPM unit, which is pretty enough to allow you to deal with most concrete workpieces you will come across. The main advantage of this concrete saw is its compactness: it has a rather small body, so it is a better tool for confined areas than most other saws we examined. CC12Y also has an interesting C-shaped handle that makes holding the saw from the side easier. If you’ve ever felt that top handles aren’t very convenient for you, then you may like CC12Y. Hitachi also includes 12-inch masonry & metal cutting blades, as well as a hex bar wrench and a spanner wrench with this saw. Lastly, Hitachi covers this saw by a 5-year warranty. Includes a 12-inch blade for metal and masonry. Compact: can be used in confined areas. The included blade is cheaply made. Hitachi CC12Y is quite a good saw for mid-volume projects and those jobs that don’t require you to have some indestructible concrete saw. Just keep in mind that you probably should get better blades for it. 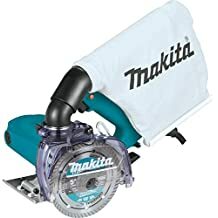 Makita EK7301X1 is very similar to K760 concrete saw we’ve just reviewed, but there are some differences between the two. Let’s start with the similarities. Firstly, EK7301X1 is equipped with a 5.1 HP 9,350 RPM motor that has 4.5 cubic inches of volume. Pretty similar to what K760 had, so you could expect comparable performance from the two. 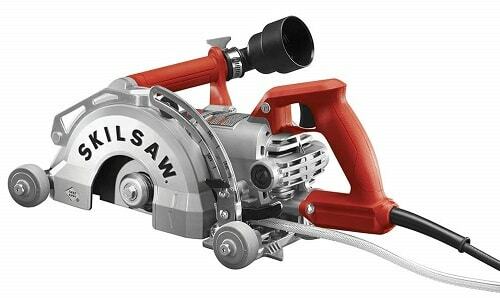 Secondly, this saw is gas-powered, so you could use it anywhere as long as the fumes are not a concern. Besides, EK7301X1 works with 14-inch blades. However, Makita actually includes one with their blade, so you should be fine at least initially. The five-stage filtration system of this saw is possibly the most noteworthy feature of this saw. It boasts advanced directional air flow to ensure cleaner air for better visibility and performance on the job site. 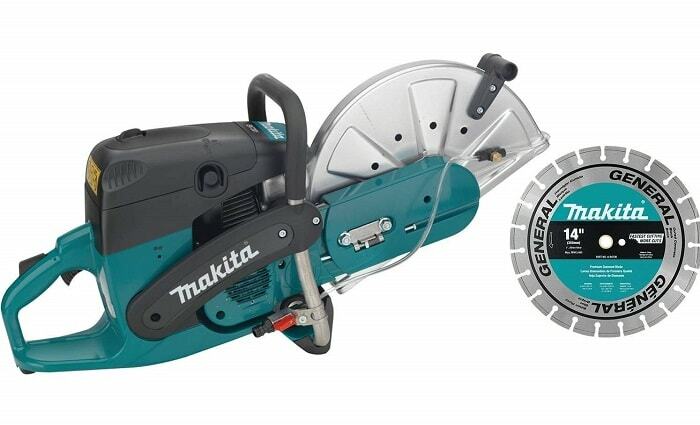 As for the warranty, Makita backs up their saw by a 3-year warranty. Includes a 14-inch diamond blade. The included saw blade isn’t that high-quality. All in all, EK7301X1 is the slightly cheaper alternative of the K760 concrete saw. Some of the latter’s benefits are absent from this saw, so we think that it actually is a good deal, given the price. SKILSAW SPT79-00 MEDUSAW is a very nice pick for projects that do not require much cutting depth from you. 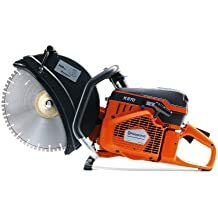 Because this thing employs 7-inch blades, it is capable of producing just 2-inch deep cuts, unlike most other saws we reviewed that do about 4 inches. 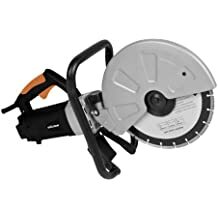 This is a good choice for handheld worm drive saw for concrete cutting. But thanks to its 15-Amp 5,1000 RPM motor, SPT79-00 should be able to deal with its tasks very well. In terms of convenience and versatility, SPT79-00 is better than the other concrete saws in the same price range that we reviewed. First of all, SPT79-00 is equipped with a wheeled guiding system that makes sliding the saw along the work surface easier. Nothing but the wheels will come in contact with the working surface. To ensure precise cuts, SPT79-00 comes with a pivoting pointer and an adjustable plunge. In addition, this concrete saw is equipped with a dust extractor port to help you reduce the amount of debris that you’d need to deal after you are done. The lightness of this saw should also be remarked: it just weighs about 17 pounds! 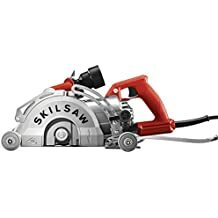 And finally, SKILSAW covers this saw by a 180-day Stay True guarantee: you could return the saw for a full refund if you aren’t satisfied with it within this period. And add to this a 1-year limited warranty. Easy to cut with thanks to the guiding system. Comes with an adjustable plunge lock and pivoting pointer for precise cuts. Has a dust extractor port. Doesn’t come with a blade. Thanks to the smaller 7-inch blade size this saw employs, SPT79-00 MEDUSAW is a great choice for more delicate projects. However, keep in mind that you’ll need to buy a blade for this little guy. Husqvarna K970 is pretty much the larger and more powerful version of K760 we examined earlier. K970 employs a monster of a motor with 6.1 HP power. Its cylinder displacement is 5.71 cubic inches, which is over 20% bigger than the motor of K760. 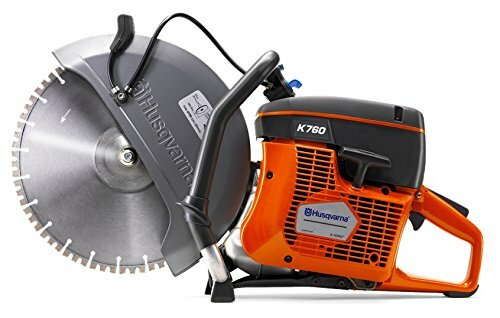 And if that wasn’t enough, K970 also works with larger 16-inch blades, so tougher projects shouldn’t be a problem for this saw. However, Husqvarna doesn’t include any blades with it, so you’ll have to buy one. As for the rest of the features, K970 is pretty much identical to K760: it also has features like a dust-sealed starter and a sturdy poly-V belt to ensure longevity. And, of course, this saw can be used both wet and dry. As for the warranty, Husqvarna covers K970 by a 1-year warranty, just like it was with K760. Gas-operated: can be used on any job sites. Cuts both dry and wet. Supports 14 and 16-inch blades. Exceptionally tough projects should be no match for the 16-inch blade and 6.1 HP motor of K970. 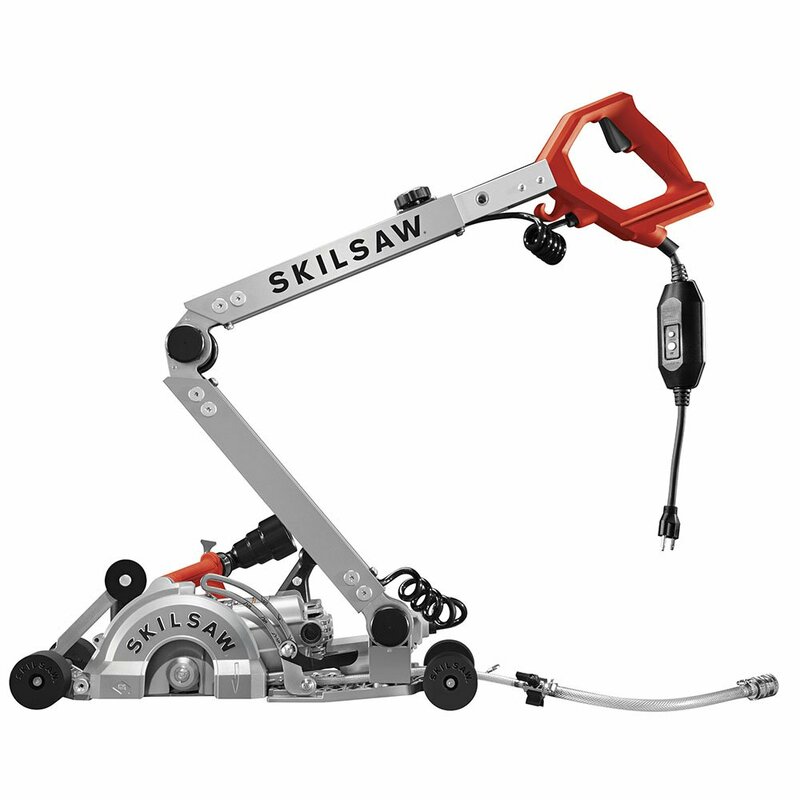 If you do a lot of concrete cutting jobs, then this saw could be a perfect pick for you. This saw looks familiar, doesn’t it? Well, it actually is the SPT79-00 saw we examined a bit earlier, but the difference is that this product is equipped with a long handle, which makes it a walk-behind saw. And remember what we said about walk-behind saws in the beginning? That’s right, they are unmatched when it comes to sawing horizontal surfaces. The SPT79A-10’s handle is designed to completely fold down, so this saw won’t occupy that much additional storage space. In addition, the handle’s length can be adjusted, so basically any person could use it comfortably. The handle also has a separate power button, so you don’t have to bend down to turn on this concrete saw. As for the saw itself, it has the same features we examined in SPT79-00 earlier, like an adjustable plunge lock or a wheeled guiding system. The cut depth is also the same 2 inches. And lastly, the warranty on SPT79A-10 is the same as on the other SKILSAW product: 180-day Stay True guarantee plus 1-year limited warranty. Walk-behind design: cuts horizontal concrete pieces very well. The handle is folding and height-adjustable. Guiding system makes running the saw along the workpiece’s surface easier. Can do precise cuts thanks to the adjustable plunge lock and the pivoting pointer. Equipped with a dust collector vacuum port. If you are looking to do perfect cuts in horizontal concrete pieces, then no other saw on the list will compare with SPT79A-10. 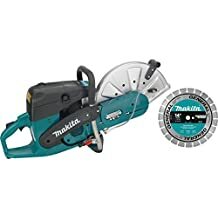 And the last product on our concrete saw review is Makita 4100KB saw, a model that is just perfect for the smallest and most precise concrete cutting jobs. All thanks to the included 5-inch saw blade with 1-9/16-inch cutting depth! The motor of this thing is also quite remarkable: it operates at 12,200 RPM under no load to make sure that the blade does its thing. A noteworthy feature of 4100KB is its transparent blade guard that is designed to increase the visibility of the workpiece. Given that you’ll be working with projects that require more precision with this saw, the additional visibility is a huge plus for this little guy. 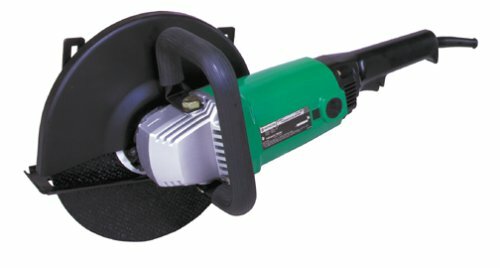 If you don’t like dust scattering around while cutting concrete, this saw has a dust extraction port to take care of the dust for you. Another important advantage of this concrete saw is that it is very lightweight and compact, so you could really use it without much fatigue. Well, as long as its blade is cool enough. 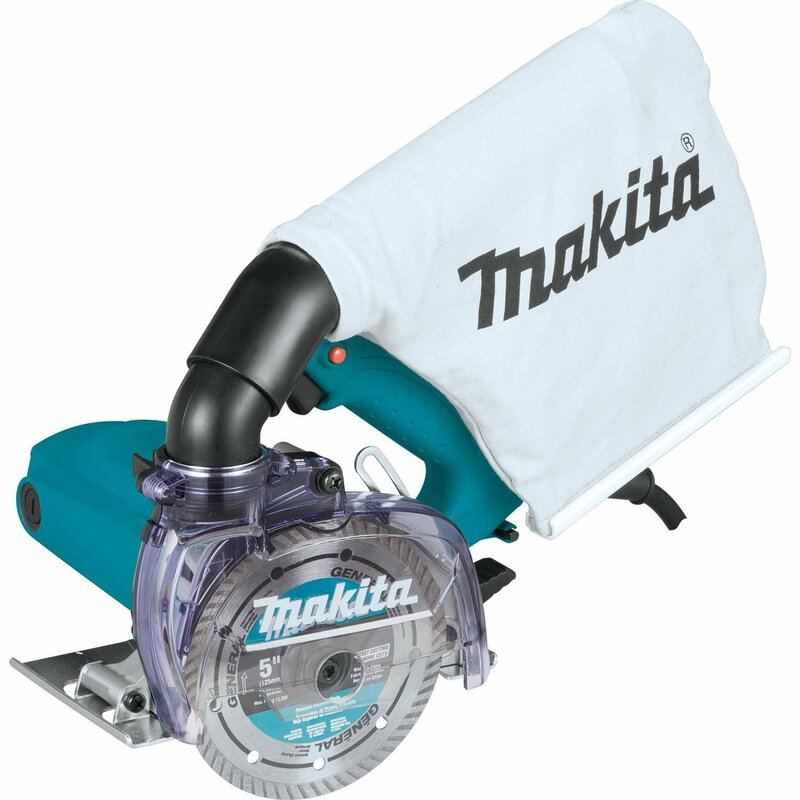 And lastly, Makita covers 4100KB by a 1-year warranty. Has a 360-degree swiveling dust extraction port. Equipped with a transparent blade guard for increased visibility. Limited for small cutting project. For smaller projects, you need a small concrete saw. And Makita 4100KB is perfect just for that. First of all, you would need to choose the saw type. It will depend on what kind of projects you do and what their volume is. If you remember, we have already described the main concrete saw types in the beginning. Keeping those guidelines in mind, choose the right saw type in accordance with your needs. The depth of the cut is one of the most important specs of concrete saws. Still, not all manufacturers indicate the cut depth of their saws in their product descriptions. The right depth of the cut will be dictated by what kind of projects you will be doing. And besides, the materials you’ll be working with also play a major role. Before choosing a concrete saw, make sure that you know what materials you will be cutting so you don’t make an expensive mistake. Portability is a rather important feature in concrete saws, albeit not for everyone. Some people don’t even care about the compactness of their saw, while others may want to get a saw that is easy to store and carry. The two factors that impact the concrete saw’s portability is its weight and size. If you want to have a really storage-efficient and light saw, you should go for the lightest and smallest saw that is able to satisfy your requirements. Don’t compromise performance for the sake of portability: instead, look for a saw that has the best balance of features. Don’t forget that power tools need maintenance and concrete saw is not an exemption. While gas-powered concrete saws require a lot of maintenance, they are the most powerful versus the electric-powered. The manufacturer of any tool plays a huge role, though some people don’t realize this. A manufacturer that can offer consistent quality and support is the one that you would want to go for. Besides, one manufacturer may specialize in commercial saws, while others only on home saws. If there is one particular manufacturer that you trust a lot, then you should most likely go for their concrete saw. 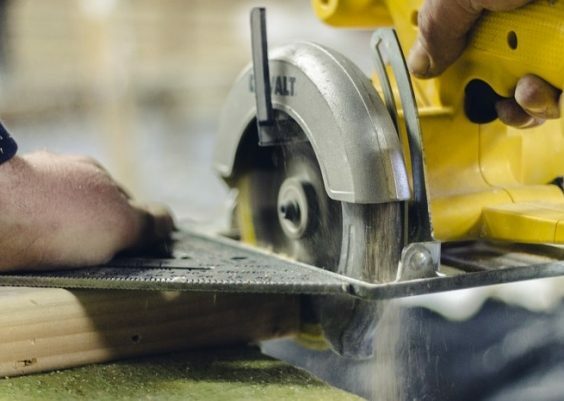 Risking and switching to a new manufacturer isn’t a thing that people like to do, so you may want to do some research on saw brands before doing so. 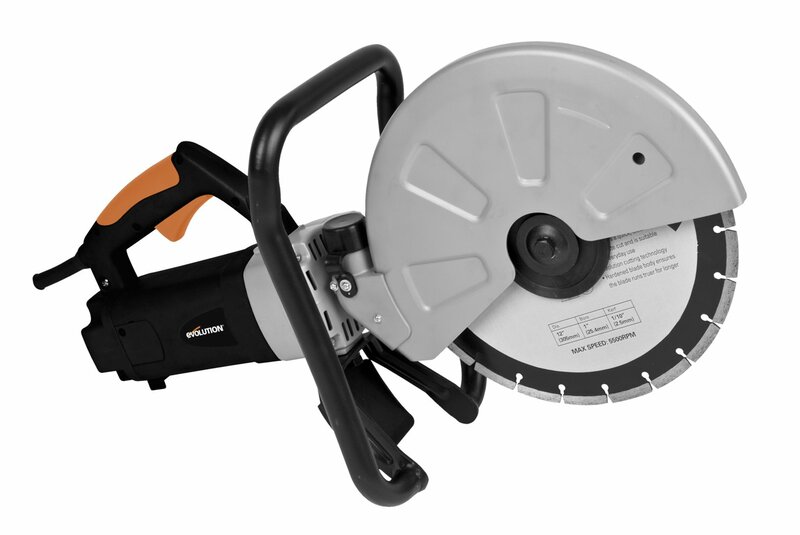 Did you find a good saw on our concrete saw review? If so, then maybe you should go and get it! Before making such an expensive decision though, make sure that you know exactly what you need. If you don’t, you might end up spending a couple of hundreds of dollars on a saw that is useless for you.